Quality custom parts at affordable prices. DX 7" Truck-Lite LED Headlight mounting bracket. 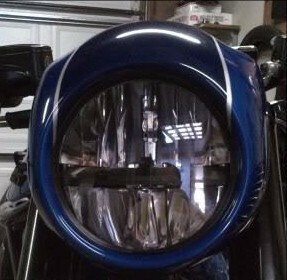 Allows the installation of a 7" Truck-Lite LED headlight in the original DX fairing. Replaces the original DX 5-3/4" headlight bucket. Includes all stainless steel mounting hardware. Gauge Relocation kit to mount gauges into fairing. This kit will mount the gauges in the fairing just behind the headlight on the VRSCDX models 2007-2011. This kit will mount the gauges in the fairing just behind the headlight on the VRSCDX models 2012-2015 and VRSCF. Creating quality custom parts at affordable prices.